Customers preordering Apple Inc’s smartwatch will have to wait at least a month for delivery, a sign of strong early demand for company chief Tim Cook’s first new major product. People flocked to Apple’s stores around the world to get a close-up look at the Apple Watch, the tech company’s foray into the personal luxury goods market, with Apple predicting demand would exceed supply at product launch. Cook, interviewed on cable television channel CNBC, said initial orders were “great” for the device, available for preorder online and to try out in stores by appointment, but not to take home. A key factor in the watch’s success will be demand once an initial wave of interest from Apple enthusiasts subsides. The watch goes on sale officially on April 24, online and through appointments in shops, including trendy fashion boutiques in Paris, London and Tokyo, part of Apple’s strategy of positioning the wearable computer as a must-have accessory. But soon after online preorders opened on Friday, Apple’s website listed shipping times in June for some models of the watch and four to six weeks for others. The Apple Watch sport starts at $349 while the standard version comes in at $549 in the United States. High-end “Edition” watches with 18-karat gold alloys are priced from $10,000 and go as high as $17,000. At a San Francisco Apple store, dozens of customers crowded around newly installed wooden cabinets, snapping pictures of the gadgets on display under glass. Apple employees, admittedly still unfamiliar with the watches’ finer points, guided customers through features like text messaging, maps and fitness tracking. At Apple’s flagship store in New York, Jack Weber, who was visiting from Charlottesville, Virginia, said he would give his wife a top-of-the-line “Edition” as a 50th-anniversary gift. “What more perfect wedding present could there be than this watch?” he said. Android is Google’s mobile operating system used on many smartwatches. Reviewers this week praised the watch as “beautiful” and “stylish” but gave it poor marks for relatively low battery life and slow-loading apps. 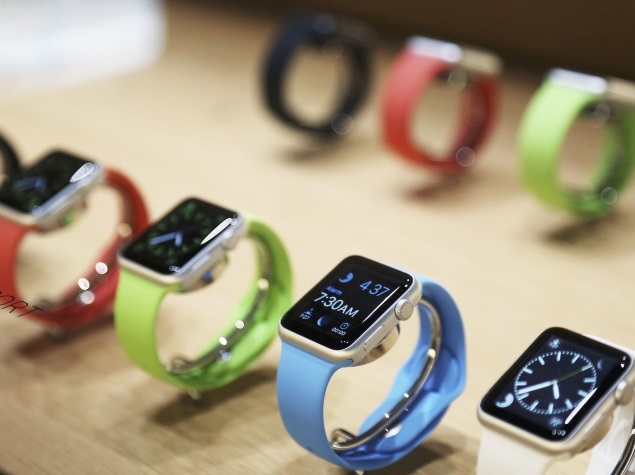 Apple’s watch is widely expected to outsell those by Samsung, Sony Corp and Fitbit. It will likely account for 55 percent of global smartwatch shipments this year, according to Societe Generale. “Apple will outsell its wearable rivals by a very wide margin but it will do this on the power of its brand and its design alone,” independent technology analyst Richard Windsor said.